The Borneo Marathon is a marathon held in Kota Kinabalu, Sabah, East Malaysia. The inaugural race was held on October 12, 2008. 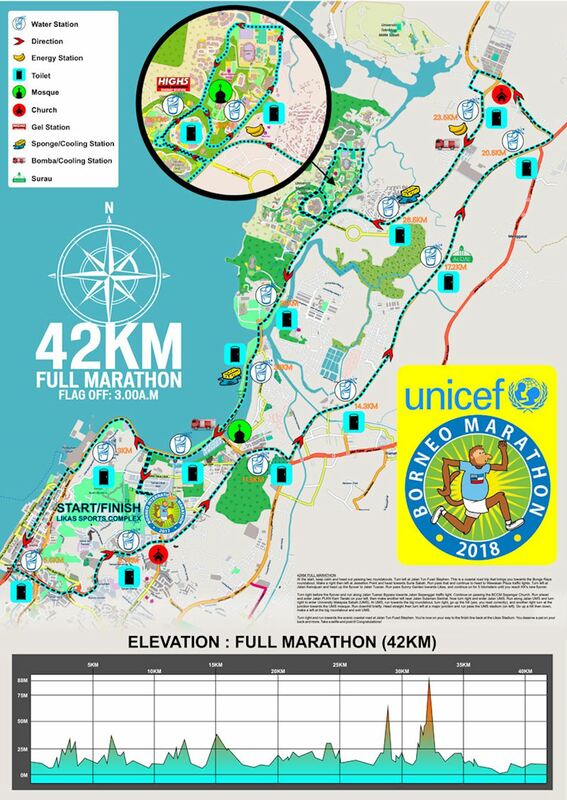 This is the first marathon in the state for over 20 years and currently the only marathon to be organized on the island of Borneo. The first marathon in Sabah was held in 1984 and it was called the Daily Express Sabah Marathon. The next marathon was called the Borneo International Marathon (BIM). BIM was organized by Championship Sport Events Sdn. Bhd., helmed by Mr. Andrew Voon as the Race Director as well as the person instrumental in organizing the Borneo International Marathon. The first BIM had three categories, 10km, 21km and 42km and was participated by a mere 529 runners. Timing Chips: The electronic timing chip provided by the organiser must be used by all runners. At the start, keep calm and head out passing two roundabouts. Turn left at Jalan Tun Fuad Stephen. This is a coastal road trip that brings you towards the Bunga Raya roundabout. Make a right then left at Jesselton Point and head towards Suria Sabah. Run pass that and continue to head to Wawasan Plaza traffic lights. Turn left at Jalan Kemajuan and head up the flyover to Jalan Tuaran. Run pass Sunny Garden towards Likas, and continue on for 5 kilometers until you reach KK's new flyover. Turn right before the flyover and run along Jalan Tuaran Bypass towards Jalan Sepanggar traffic light. Continue on passing the BCCM Sepangar Church. Run ahead and enter Jalan PLKN Kem Tanaki on your left, then make another left near Jalan Sulaman Sentral. Now turn right and enter Jalan UMS. Run along Jalan UMS and turn right to enter University Malaysia Sabah (UMS). At UMS, run towards the big roundabout, turn right, go up the hill (yes, you read correctly), and another right turn at the junction towards the UMS mosque. Run downhill briefly. Head straight then turn left at a major junction and run pass the UMS stadium (on left). Go up a hill then down, make a left at the big roundabout and exit UMS. Turn right and run towards the scenic coastal road at Jalan Tun Fuad Stephen. You're now on your way to the finish line back at the Likas Stadium. You deserve a pat on your back and more. Take a selfie and post it! Congratulations! From the start point, head out passing two roundabouts and turn right along Jalan Tun Fuad Stephen. Run pass Jalan Yayasan Sabah and enter UMS. At UMS, run towards the big roundabout, turn right, go up the hill, and another right turn at the junction towards the UMS mosque. Run downhill briefly. Head straight then turn left at a major junction and run pass the UMS stadium (on left). Go up a hill then payback down, make a left at the big roundabout and exit UMS. From the start point, head out passing two roundabouts then turn left along Jalan Tun Fuad Stephen. Run along this coastal road and make a Uturn at Sabah Port (before the Bunga Raya roundabout). Run back towards Likas passing the roundabout earlier. Enjoy the view as you continue to run towards the City Mosque or also known as floating mosque. Make another U-turn here and head back to the stadium finish line. You're a #runner. Well done!